Joann (Ioanna) Stavrides fell asleep in the Lord on December 4, 2018, surrounded by her family. She was 71. She was born Giannula Tsakiridou in Polykastro, Kilkis, Greece to Anastasio and Androniki Tsakirides (Maghnisali). At the age of 24, after a brief correspondence, she met and married Steven Stavrides, and immigrated to the United States of America. Joann had three sons, Angelo, Peter, and Andrew. Never receiving formal education in the United States, she learned the language and became a U.S. Citizen, she was very proud of that accomplishment. She owned and operated, along with her husband, the East Rock Confectionary Store in New Haven for many years. What she loved most was being a Mother and Grandmother. She was strong-minded but made friends quickly. She also loved making her home warm and inviting to all. Joann loved to have family get-togethers where she would prepare elaborate meals and made sure no one left hungry or without extra food to take home with them. She enjoyed knitting blankets for her family and friends. Keeping people she loved fed and warm was a priority of hers. She especially enjoyed traveling to Greece. In the last several years of her life, she would spend summers back in her childhood home in Polykastro, making improvements and additions to it. She enjoyed the time there with her family and friends. Joann loved her Greek heritage and was always very proud of it. She let everyone who met her know about this. 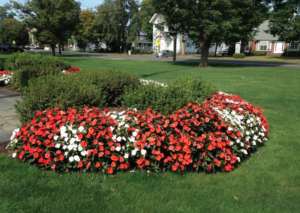 Joann was a longtime member of St. Barbara Greek Orthodox Church, and was a member of the Philopticos Society and had also served on the Parish Council. She loved being a part of the community of St. Barbara. 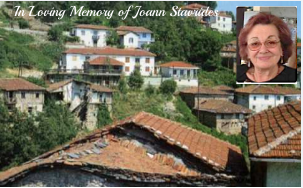 Joann was predeceased by her parents, a granddaughter, Andreana Stavrides, and a nephew, Georgios Georgiades. She is survived by her husband of 47 years, Steven Stavrides, of North Haven, CT, sons Angelo (Janet) Stavrides, of Cheshire, CT, Peter Stavrides, of Virginia Beach, VA, and Andrew (Joanna) Stavrides, of Northford, CT. She leaves behind three grandchildren which she loved more than words can explain, Sophia, Nicholas, and Eva Stavrides. Joann also leaves behind a sister-in-law, Helen Piperas of Hamden, CT, a Goddaughter Irina Tsilfoglou of Wallingford, CT, and many nieces and nephews. In Greece, she leaves behind her brothers Demetrious Tsakerides, and his wife Sophia, Panagoitis Tsakerides and his wife Eleni, and a sister Eleftheria Georgiades. She also leaves behind in Greece many cousins, nieces, nephews, great-nieces, and great-nephews, along with many other extended family and friends. Friends may visit at St. Barbara Greek Orthodox Church, 480 Racebrook Road, Orange, CT on the evening of Sunday, December 9, 2018, from 5 p.m. to 8 p.m. A funeral service will take place at the church on Monday, December 10, 2018, beginning at 9 a.m. Burial will follow at All Saints Cemetery, in North Haven. To leave a condolence please visit www.celentanofuneralhome.com.